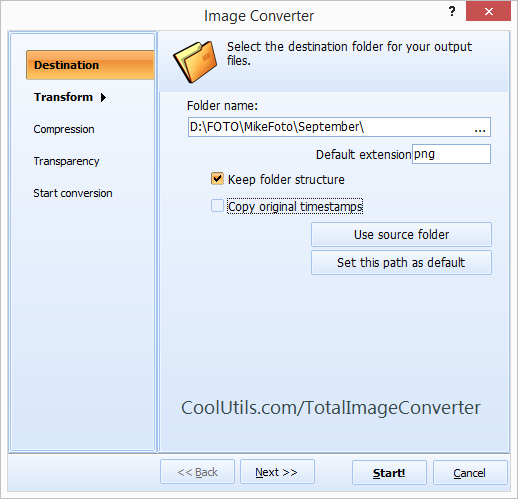 Total Image Converter supports, among others, a very important file format conversion: PNG to JPEG. PNG (Portable Network Graphics) format is popular with graphic designers. It supports layers and is correcty interpreted by the most sophisticated graphic processing software like Adobe Photoshop or Macromedia Fireworks. It is a lossless format that still can achieve good conversion rates in some cases, but when you work, for example, with huge photographs produced by digital cameras, PNG files can become large enough to be completely useless for any practical purposes. When you work with photographs, JPEG becomes your best choice. JPEG (also known as JPG) stands for Joint Photographic Experts Group. It was developed handle photographic images and achieve the best conversion rates while still maintaining excellent quality of the photos. JPEG is very popular among webmasters who use photos for their graphic design. When your complicated PNG graphics created in Photoshop or Fireworks are ready, you will probably convert it to JPEG to reduce the size of the file (in bytes), before using it on your website page. If your graphic images are usually sent to you by a third party graphic designer, you don't need to store both PNG and JPEG on your hard drive. 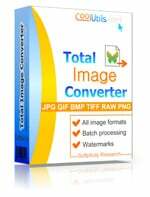 As long as you have Total Image Converter, you can always convert the PNG original to JPEG (as well as to many other popular graphic formats). 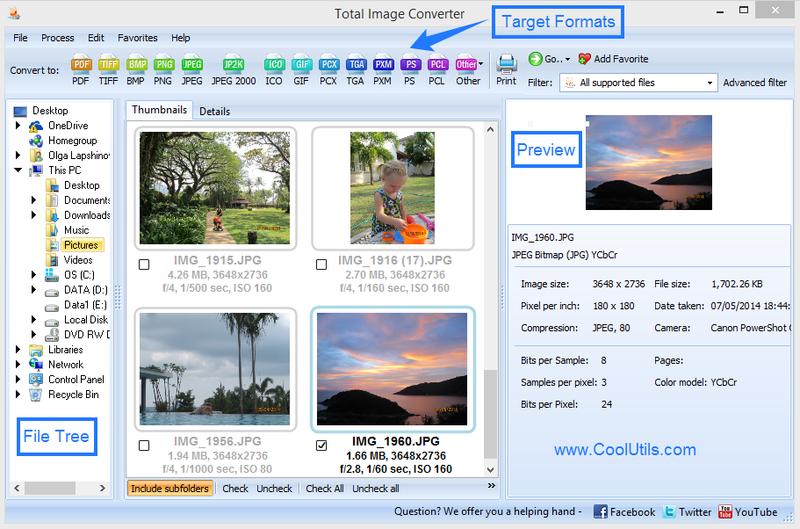 Should you need to convert your JPEG files into another graphic format, Total Image Converter will do it for you as easily as it converts PNG files to JPEG.